The village of Batlava is inhabited by ethnic Albanians. The artificial was created during the communist era as a water supply source for the Pristina and Podujevo region. Batlava Lake is the main source of potable water for the cities of Pristina and Podujevo. As a result of the cities' population growth, withdrawal regularly exceeds inflow, especially in summer. Batlava Lake is a popular destination for locals. Thus, tourism is a large revenue source for the local village. The lake is in the Lab region and is fed by the Batlava River from the north. The village of Kolić is also located quite near the lake. 1 2 Kosovo is the subject of a territorial dispute between the Republic of Kosovo and the Republic of Serbia. The Republic of Kosovo unilaterally declared independence on 17 February 2008, but Serbia continues to claim it as part of its own sovereign territory. The two governments began to normalise relations in 2013, as part of the Brussels Agreement. Kosovo has received recognition as an independent state from 110 out of 193 United Nations member states. 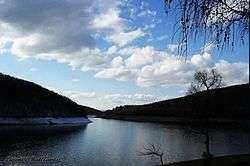 Wikimedia Commons has media related to Batlava Lake.